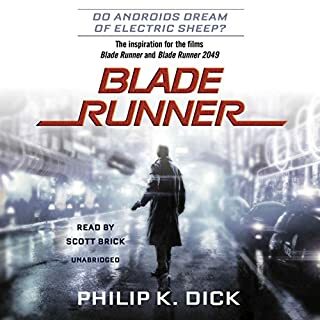 Originally published as Do Androids Dream of Electric Sheep? It was January 2021, and Rick Deckard had a license to kill. Somewhere among the hordes of humans out there lurked several rogue androids. Deckard's assignment: find them and then..."retire" them. Trouble was, the androids all looked exactly like humans, and they didn't want to be found! Locked behind bars for three years, Shadow did his time, quietly waiting for the day when he could return to Eagle Point, Indiana. A man no longer scared of what tomorrow might bring, all he wanted was to be with Laura, the wife he deeply loved, and start a new life. But just days before his release, Laura and Shadow's best friend are killed in an accident. With his life in pieces and nothing to keep him tethered, Shadow accepts a job from a beguiling stranger he meets on the way home, an enigmatic man who calls himself Mr. Wednesday. Frank Herbert's death in 1986 was a tragic loss, yet the astounding legacy of his visionary fiction will live forever. Frank Herbert, I OWE you. I owe you a LOT. This was one of the very first books that truly stirred my love for science fiction. You SPOILED me. You made me demand better writing from the authors I followed, and better development, as well. From this book on, I became harder on myself, to read works that challenged me, that made me ponder well after finishing the novel. I hungered for better writing that combined story, action, flow, cadence and for God's sake, CREATIVITY. Thanks, Frank. THAT'S what good writing demands of us, and if the author excels at his or her craft, this book is the perfect example of what can happen. In Dune, you get galaxy-sweeping politics, messianic jihads, genetically-enhanced warriors and spacefarers, pirates hiding ruling classes, clones that psychically destroy their victims, fantastic ecologies and creatures, religions that manipulate families and bloodlines, and countless castes intertwined with ruling houses that all depend upon a drug found only on one desolate planet - A planet with its own secret and massive agenda, hidden within the howling desert plains covering its surface. And wait, it's followed by yet ADDITIONAL novels in the series, some better than others, and then yet ANOTHER series by the author's SON, done decades later, that provides tremendous PREQUELS, based on his father's notes? Finally, throw in excellent male and female narrators that fit the characters they portray, and individualize each character. Come on. Do you really need another great review to buy this audiobook? I first read this book in 1980 in the back seat as my family did a two week camping road trip, and I loved this story. I must have read Dune over 20 times, it was that good to me. When I heard about the audio book I was a bit hesistant that they might ruin one of my favorite stories (like they did with the movie!!). But the narration and characterization of the actors, were wonderful, giving the story a richness and fullness, a 3D immersive experience. It made a great story that much better. 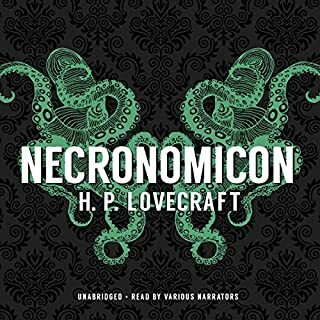 Starts out great but then the narrations begins to vary, sometimes it sounds like a full cast performing, then it switches to a single narrator doing voices, then that narrator is switched with another who sounds totaly different. Then it goes back to the full cast w/ many voices. The changes are jarring and happen without warning often in the middle of a chapter so you are constantly confused as to who is speaking and what is going on. There is no consitency in the narration of voices- all very random and sporadic. A headache of a listen and considering the level of detail and involved plot elements this makes for a very confusing experience. WOW!! The narration in this book is always good with segments that are GREAT. There were some complaints about the changing of accents or voices. I think of this in these terms. The normal narrator goes along telling you the story, and then at times there is an 'enhanced' scene, a scene where the voices are really acted out, usually with several different voice actors. I think of this as a picture in a book, this enhanced scene has a different set of voices because of the change in actors, but at these times you are also sucked into the story a bit more. Eventually the enhanced scene ends and the story is passed back to the standard narrator. As for the sound effects and the music, I think they all add to the richness of the story. I was never distracted from the story because of them. When I first heard the change between the 'enhanced' scenes and the standard narration, I was a little confused, but I quickly recognized the extra enjoyment I got from these enhanced scenes, and looked at them as a positive factor rather than seeing them as a negative. If I had known, going into the recording that it happened this way, I don't think I would have been confused at all. I think if you go into this thinking that the story was recorded with an excellent narrator, then the producers went back and 'enhanced' certain scenes for your enjoyment, you will be able to fully appreciate the wonderfulness of this recording. Overall this was a great listen. However, I was somewhat annoyed how sometimes the voice of different characters were spoken by different actors, and sometimes they weren't. At one point even within one chapter they switched back and forth which mad it somewhat confusing. I did enjoy some of the sound effects though. Great listen! If your only experience with Dune was the horrific movie, read on. The mini-series was much better, but does not hold a candle to the original novel. If you read and loved the original, you may be surprised how much you will enjoy this audible version. Dune is more than great Sci-Fi, it is great fiction. I recently re-saw the mini-series and immediately wanted to experience the unabridged original again. The book was even better than I had remembered. The prose, the characters, and the story are all superior. I was surprised there were quite a few subtle nuances in the story that I had not picked up on in my pervious several readings. I enjoyed this immensely as this is rare in all but the best of fiction. Unfortunately the rest of this series does not live up to this powerful beginning, but not to worry, Dune stands alone. I strongly recommend this book even if you really disliked the movie. There are images and characters in this novel that have affected me strongly since my childhood and influenced me as a person. There are few works of fiction that I both enjoyed and appreciated as much as Dune. I generally don’t like music or sound effects in an audio book, but here the sound-effect are light and don’t distract from the story. The narration, although not perfect, is quite good. This audio edition does the work justice. The only reason I give it 4 stars instead of 5 is because of the structure of this audio book. It is theatrical with many characters (many voices) and then it changes to the main narrator who will also do his own versions of the character's voices. It would have been better if it was either narrated by one person or a theatrical presentation with many actors, but not both. I hope that I made this review clear. Best Audiobook of the Year ... Decade? 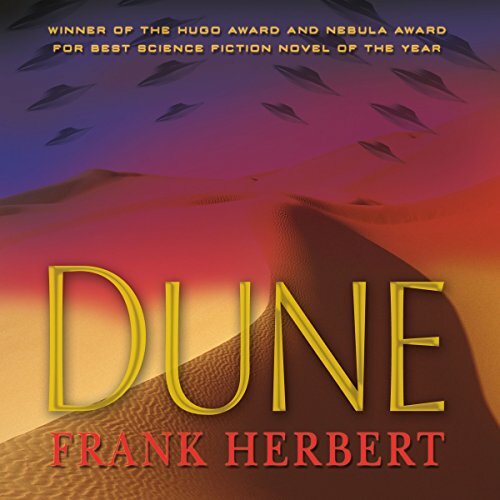 I have listened to over 100 audiobooks on audible.com and can say, without reservation, that this performance of Dune is in my all-time Top Ten. If you have never read (or heard) Dune before, understand it as a masterpiece of future fiction. It is comparable to Lord of the Rings in its detailed other-worldliness and its steady hold on the reader. The book is of a sand world populated by evolved humans and replete with political intrigue, religious overtones, love, death and battle. This performance is rich and theater-like. Each character has a voice. It never sounds contrived or overdone. I know you will not regret purchasing this book. The story itself is fantastic. Deservedly hailed as one of the greatest stories ever told, sci-fi or otherwise. A fully realized and richly detailed alternate universe filled with science, religion and political intrigue. A must read. Unfortunately, the audio recording does not fulfill expectations. 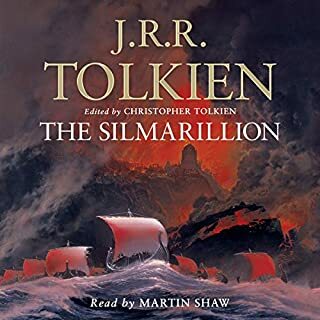 While far better than the original single reader audiobook (be glad you didn't spend 25 hours listening to THAT) the 2007 version is marred by the bizarre decision to have each reader read a chapter or section rather than have each reader read a character's part throughout the book. In other words, the voices for each character change throughout the book!!! Why? Baron Harkkonen's voice suffers the most. At one point it sounds like Michael Clark Duncan is voicing him and others it sounds like a sleepy Orson Welles. It's a shame that one of the greatest books ever written has never received a proper translation into another medium. David Lynch's movie was stylistically and visually fulfilling, but the story edited and changed dramatically. The Sci-Fi channel's 3 part miniseries held more closely to the original plot, but the budget and casting left alot to be desired. The original 1997 audiobook was read in a horrible monotone and finally the 2007 version's inconsistent readers. Hopefully someday Dune will receive a treatment that it deserves. Dune is difficult to grasp at first and requires patience, even for an avid sci-fi fan like myself. Here's the trick to stories like this one: don't try too hard. You won't understand everything at first, but that's ok. Just keep reading. Everything will become clear soon. Dune is a superb story and rightfully deserves praise. The setting is brilliant: the planet and its inhabitants are intricate and arcane. You can feel the sand in your shoes and your lips cracked with thirst. The characters are well rounded and the spice (and its effect) is truly creative. Dune does have a few flaws. For one, Herbert's writing is a bit unpolished. One of his bad habits is the lack of a consistent viewpoint. Within one section, we may jump from Paul's perspective, to Jessica, back to Paul, and then into third-person omniscient for a bit of narrative. It is awkward and amateurish. The plot is detailed and well-paced and my only quarrel with it is that Paul's over-confidence and detachment made the ending feel somewhat anti-climactic. It certainly seems set up for a sequel (and there are many). A lot of reviewers have complained about the narration but don't let this deter you. Most of the the story is read solely by Simon Vance (who, by the way, is an excellent narrator). Yet, sometimes, and without any noticable pattern, the dialogue is read by a variety of narrators with Vance only doing the narrative. I have no idea why it was done this way and it is indeed inconsistent. Once you learn to expect this, it isn't that bad. It certainly isn't as terrible as some reviewers are claiming it to be. Regardless, all of the narrators are talented and they make easy work of the complex pronunciation and accents. Also, the background sounds and music were excellent and they really added great effect. I absolutely loved the quotes at the beginning of each chapter. It is a unique and enjoyable production. A superb production of a sci fi classic! I won't dwell on the book itself - it is for many the highwater mark of the sci fi genre; superbly written, richly detailed, boiling with wonderful ideas and concepts, and giving an impression of historical depth that (almost) rivals Tolkien's The Lord of the Rings. Rather, I'd like to comment on the audio presentation. Potential listeners should have no hesitation in downloading this immediately! Simon Vance is the main reader, and - as always! - his reading is of the highest calibre - clear, faultless pronounciation, and with a fine balance of character voicing without over-acting. Although it's billed as a full-cast reading (from the superb Audio Renaissance team), the full cast are only used on some chapters, while Simon Vance reads many chapters solo. And while I love the Audio Renaissance team, I actually found the solo Vance chapters even better. A very highly recommended listen! And what great news that the sequels will be available over the upcoming months! I first read this book years and years ago. After getting an iPod, to while away the hours at work, cnc programmer and operator, I decided to try an audio book. I went for Dune with the thought of 'I've read it, so lets see how it listens' so to speak. AMAZED. I loved every minute, got totally engrossed, beautifully read, good background mood music, thoroughly enjoyed it. Next audio book please! I read 'Dune' in my teens and adored it - the complexities of the story and the depth to which the eco-system of the desert planet is planned are quite breathtaking. So I was looking forward to having the audiobook so I could re-live the wonder. Unfortunately this is a bit of a fragmented production. The main narrator has a voice fitting to the scope of the book and reads well. However, my guess is that originally the production company brought in other actors to read the dialogue - but for an ABRIDGED version. But they didn't bother to use them to complete the unabridged recording. Therefore, at some points, we have dialogue of the main characters read by other actors (often with some annoying 'atmospheric' sound effects, music or irritating echoic effects in the background). Then at other sections of the story all the voices of dialogue are provided by the main narrator, which makes the whole thing sadly disjointed. Ironically, I think it works far better with the narrator alone providing all dialogue - so the company could have saved themselves the cost and trouble of getting other people in and would still have ended up with a better, more choherent performance of the book. I will still finish listening to the audiobook, just to enjoy the marvellous story, but I feel the oddities of the recording will always keep me from being completely immersed in the tale. Dune is a book of high tension, filled with treachery, suspicion and dangerous characters with dark motives. The early scenes of this audiobook are dramatised and they capture the mood expertly. This is edge-of-the-seat stuff and makes for compelling listening. I could feel the 'gom jabar' at my own neck as my hands went all clammy! What a pity the dramatisation lessens, giving way to straight narration as the book progresses. It is read very well throughout but it could have been so much more gripping if the full cast had been retained. Another annoying gripe, common to so many audiobooks. Why can't the audio 'chapters' correspond with those in the book instead of ending randomly mid paragraph? It makes navigating a long book unnecessarily difficult. I loved the 1984 film adaptation of Dune as a child, but I have never read the book. I went through this audio book, Twice! In one week. What a story and to think it was published in 1965. I really loved the way this book is written and audio production is the best I have every heard, and adds to the entertainment value. There is a the main narrator Simon Vance who is brilliant, but the additional narrators and ambient sounds used add more colour to the sound. Scifi may be back drop to this story, but the main drama is in the relationships and the characters. I urge non Scifi readers looking for a good book with great intertwining plots, varied characters told in a oracle like voice to listen to this story. I enjoyed this more than Lord of the Rings, which I do like. I like a long story that is well written and this is one of the best. When I was a teenager I thoroughly enjoyed (and found myself transported to) Dune and appreciated it as much as Catch 22 and Asimov's Foundation series. When I was a thirty-something I tried to enjoy the film version without much success. As a fifty-something I am amazed by the richness of the experience provided by this audiobook. The combination of straight narrative and dramatisation works to bring the book to life in a way I did not expect. I recommend listening via an iPod/MP3 player with headphones. If the spoken word can evkoe pictures in your mind, your are in for a cinematic treat! 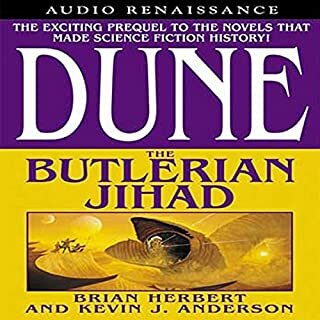 This is a superbly read, expertly-produced audiobook that draws the listener headlong into the world of Arrakis and the adventures of Dune. The narration, acting, music and effects all compliment each other beautifully to create an experience that does true justice to this Sci-Fi epic. This is a great book. One of the most detailed and compelling books i have ever read and now its even better to listen to. Frank Herbert(author) has created an entire universe with great detail helping you to imagine each environment easily. While it is generaly assumed that this is a sci-fi book there is no space battles and the way that Frank explains each place it is easy to fall into the assumption that its a simple fiction book. With voices that are very easy to listen to. 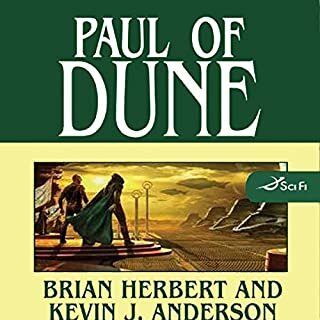 You can have many an hour of fun enjoying the first in the series of books by Frank Herbert, there are also many books that continue the storyline layed out by Frank written by his son Brian Herbert and Kevin J Anderson. After listening or reading this book I can pritty much guarantee that you will want to read or listen to the next set of books. 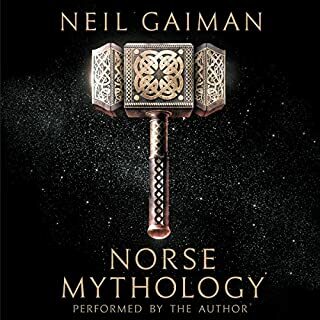 The only thing i would say is that currently audible uk does not have any of the other books available however they are very much worth reading. I hope you like this book as much as i do. Personaly i would recomend reading the books in the following order. I recomend this to help explain storylines. (the numbers is the number the book is currently in, in timeline order, not order of been written). Dune(7), (then jumping back in time about 30-40 years earlier) House Atredies(4), House Harkonen(5), House Corino(6), (jumping back to after Dune) Dune Messiah(8), Children of Dune(9), God emperor of Dune(10), (jumping back in time to many many years before Dune) The Butlerian Jihad(1), The Machine Crusade(2), The Battle of Corin(3), (now the grownding for the machines and the jihad has been established back up to after god emperor) Heretics of Dune(11), Chapterhouse: Dune(12), Hunters of Dune(13), (and the soon to be released) Sand worms of Dune(14). Anyway i hope you enjoy the series as much as i have and I look forward to more of the books coming onto this site. 'Dune' is a classic, full of mysticism, and political machinations. An adventure novel which defines science fiction writing. No review can really do it justice, and after all it has already been praised and rewarded over the decades. This audio recording is a new take on the story and a wonderful contribution to the book and the movie. Narration is of the highest calibration and variation between joint team and solo production of different parts of the story will give you joy for hours. The narration wasn't for me. I do like Dune. It is a classic of science fiction. Given the current warnings from prominent scientists about AI, and the impact of religious violence on our world, it raises interesting speculation about the future. I've read the book in print several times over the last 30 years. The narration didn't really work for me, however. The main narrator had a kind of 'grand' tone to his voice, a little too reverent, as if every sentence was a morsel of deep importance. I found myself turned off. His female voices suffered that problem many male readers have, of making them too 'fluffy' (surely not, for Jessica! ), but it was the overall tone that defeated me. I didn't make it through to the end, it became a chore, so I finished it off in my printed book. A lot of people here seem to disagree, and thought the reading was exceptional. I am very willing to accept it just didn't work for me. I prefer readers who sound like they're enjoying the story. Dune is a remarkable epic that sits at the epicenter of the genre. As an audiobook however...this is a shambles. Its as if the budget was expended on the atmospheric sounds effects and background music and with the funds running low the studio just randomly selected bits for the voice actors while the rest was read by the narrator. Not only is it confusing....its at times hilarious. In single scenes you can have three different voices for one character ( remembering Herbert's love of the third person or thoughts of his characters)...hilariously these innermost thoughts can be a totally different actor, voice....god even accent. there are times the primary narrator just seems to forget what voice he uses for a character....you are absolutely lost. watch out for his attempt at Chani when she first appears... How can I liken this experience? Have you ever tried to make an omelette while suffering with a hangover...... with each egg you crack, shell ends up in the bowl...no matter how much you try it just gets worse with the end result being a complete and total yoke ( egg humour)...I digress.... back to analogy... so finally after cooking the omelette you sit down ready to tuck in before throwing up last night's curry with a good helping of vodka flavoured bile. That's the feeling I had as the book ended. Any number of reviews will tell you the importance of Dune, the depth and detail that Frank Herbert has taken to craft a thrilling story, amazing characters and a universe that in 2015 is still unique. This review however, sets to highlight that this reading of Dune is exceptionally bad. The book is read mostly by a single person (altering his voice for different characters, if only slightly) but bizarrely will have characters such as Jessica and Paul be taken over by other narrators seemingly at random parts of the story with seemingly no consistency on who is 'playing'. More confusingly a narrator for one key character, such as Leto Atreides will return later with exactly the same voice (that is to say, not altering it at all) to play a different character. This performance is disruptive and simply not good. Either have it read by a single narrator or have some consistency with who is reading each character. The most egregious case of this was halfway through a chapter in which two key characters were talking, a small break takes place, and it returns with new narrators for these characters. Why? The story isn't ruined however. The performers are true to the words of the book and it will not inhibit your ability to get the genuine experience but at times it is jarring and confusing. What made the experience of listening to Dune the most enjoyable? Voice was very easy to listen to and the occasional accompanying music was a good touch. The voice actors - although they tend to change occasionally which can be confusing. The final two chapters are very exciting. The voice actors change which makes the book a little confusing and the language of Dune can be hard to follow. Go with the flow and you'll enjoy it. some people said they found the narration confusing, I was at no point confused. there are multiple actors playing the different characters and it was very easy to follow. there are even Atmos sfx and music moments. The story is gripping, detailed, visually splendid and worthy of a long read. The narration irritated me eventually. There doesnt need to be several people reading it. Just hire one of the best narrators for this classic. Anyway, seen the various movies and series and i can honestly say that the book adds to.those. People who say they didnt need to read the book because they saw the movie.. are clearly deranged- or have never read a trully satisfying book in hard copy. The book itself is great, a classic. The narration is a bit disappointing. They have voice actors for the major characters, but in half the book they are absent and all the characters are instead voiced by the narrator. wow I feel like an idiot. I thought that it was an unabridged reading. I wish there was a full copy of this book that I could listen to because I love the story. I typically do not like multiple actors but in this case it is done well.